Thanks for the smile, Smokey. 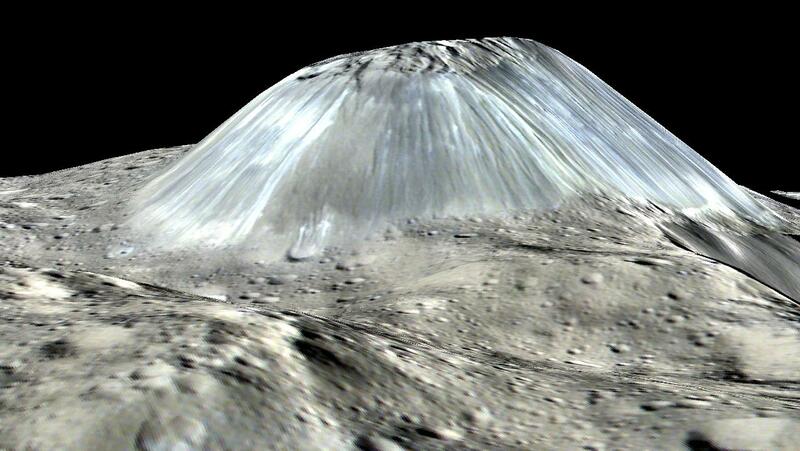 I wonder at NASA (&Co)’s motivation for ‘exaggerating the elevation of Ahuna Mons by a factor of two’. If reality isn’t impressive enough, it seems we just skew it to make it more impressive. Of course, there are often reasons to modify an image to bring out hidden details; but this case seems very poorly motivated. Tsuchan – I can certainly see your point, but I like the image because it seems like you’re really there. I’d like to believe that was the point for the exaggeration. From a distance on the ground, Ahuna Mons fills only a small part of one’s field of vision, but getting close, as the photo attempts to do, fills your gaze in an exaggerated way the same way standing close near a big mountain does. It’s a partial attempt to make up for the weird perspective of the computer generated topography. In these images (and those of places like Olympus Mons) the perspective is generally set a tremendous distance away, and a kilometer or six above the surface in order to show the whole mountain/canyon in a single image (which would be impossible in a real image taken from the surface). If you don’t exaggerate the surface features, you end up with a perspective that weirdly diminishes the true height of the object. In order to counter the perspective, they vertically stretch the object to make it look a tiny bit more like it would look if you were standing on the surface. But… not really;). All it really does is lead to a skewed perspective. 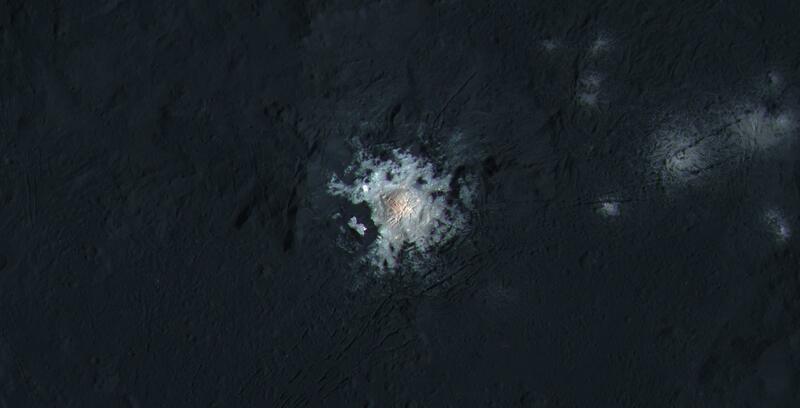 It’s hard to believe there might be liquids below the surface of Ceres.. but there it is. Key might be determining the age of that nearby crater? Is there an ‘match’? Could the ratio of the size of the crater be used to estimate the energy released on impact? Could that be keyed to building a cryo-volcano of that size? It is said that there are more answers than questions. I hope that’s true, especially in this scenario. What an awesome mission! Go DAWN! Previous PostPrevious What is Tornado Alley? Next PostNext Does Our Galaxy Have a Habitable Zone?